From Accademia we headed to the Uffizzi gallery. 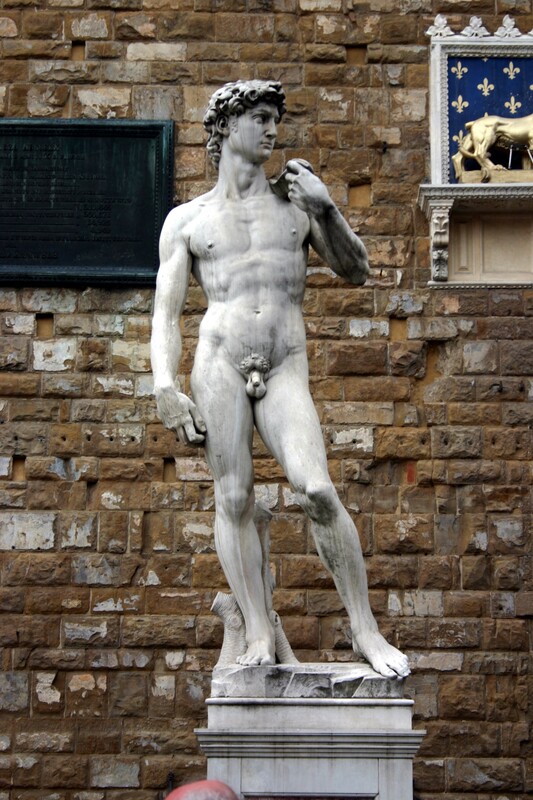 On the way enjoyed the sculptures including the replica of David in Piazza della Signoria. We had to wait around 45 minutes to get inside Uffizzi. We spent around 2 hours soaking in the paintings and sculptures by various artists. Relaxed for a few minutes in the cafe upstairs. Nice view of Florence from there. 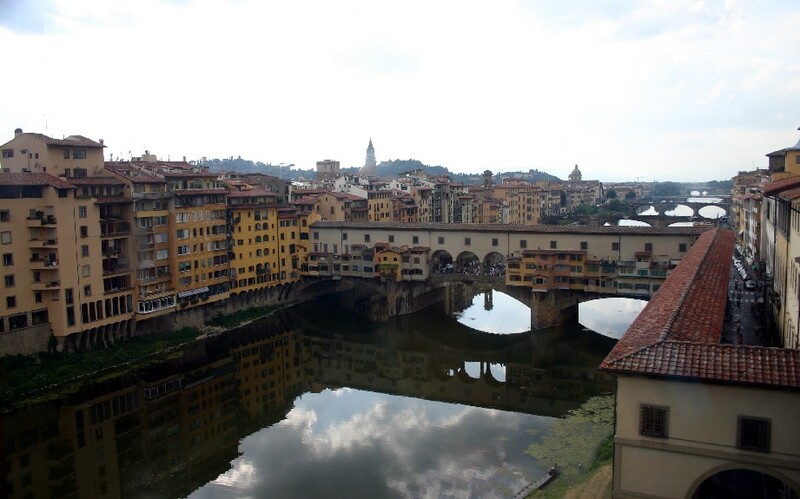 From there we headed to Piazza Michael Angelo via Ponte Vecchio the famous old bridge with gold market on both sides. On the way, had awesome gelato at Gelateria Carrozze. Awesome pista flavor. With gelato in hand, walked on the crowded Ponte Vecchio while glancing the gold jewellery shops. It was a good 45 minute walk to Piazza Michael Angelo. The last 10 -15 minutes were climbing steps on a hill. Huffing and Puffing reached the Piazza at around 7pm to watch the sunset over Florence. The view was beautiful. Lot of people were sitting there painting the beautiful scenary. Relaxed there for an hour soaking in the beauty of Florence and the green David replica in the Piazza. After another pista gelato on the way, headed back to the hotel. Went to a nearby trattoria for dinner. Not that good for vegetarians. 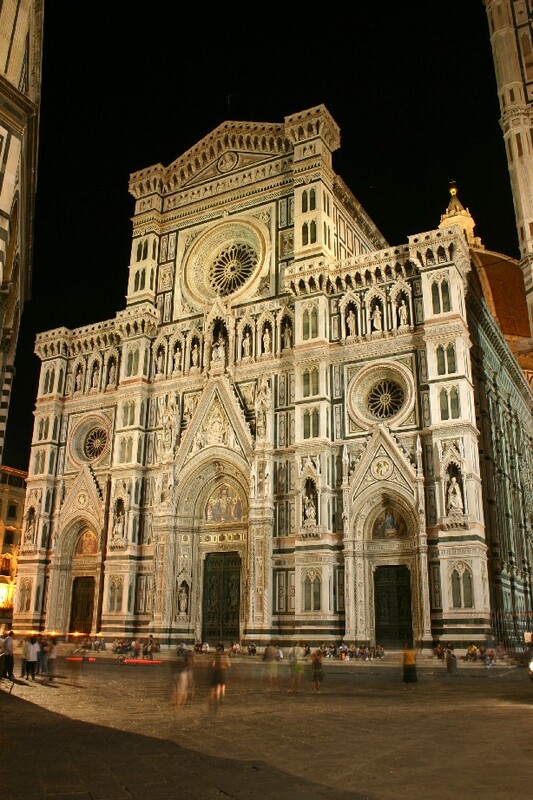 After an ok meal, came out and saw the beautiful Duomo in night light. It was so breathtaking. So went back to hotel and brought back the tripod. Then started clicking away the awesome Duomo, Baptistry and the Campenile. After spending sometime in the plazza, came back and called it another wonderful long day!! We reached Florence around 7:30pm. We walked to our hotel. Our Hotel was about 10 mins walk from the station. Easy to find and it was 100 yards from the famous Duomo. We were stunned by the Dumo view. We stayed at Hotel Perseo. It was a cute bed and breakfast. The owner Laura suggested a few restaurants. We chucked the bags in the room and headed for dinner. We went to a nearby restaurant “Ciro & Sons” in via del Giglio as suggested by Laura. It turned out to be awesome. We had the white bean soup and pizza, limoncello and an awesome chocolate dessert. The pickled olives they served with bread was awesome. Came back to the room happy and called it a wonderful day! Next day morning got up around 7 and had a nice breakfast in the hotel (Husband claims the capuccino was awesome), then left for Pisa. Took the 1 hour train to Pisa. From the station, went to the information center, took the city map and walked towards one of the 7 wonders. Lot of college crowd in Pisa. Also lot of construction going on there. Leaning tower is a good 40 minute walk from the station. Itz a scenic walk. We were thrilled once we got the first glimpse of Pisa. 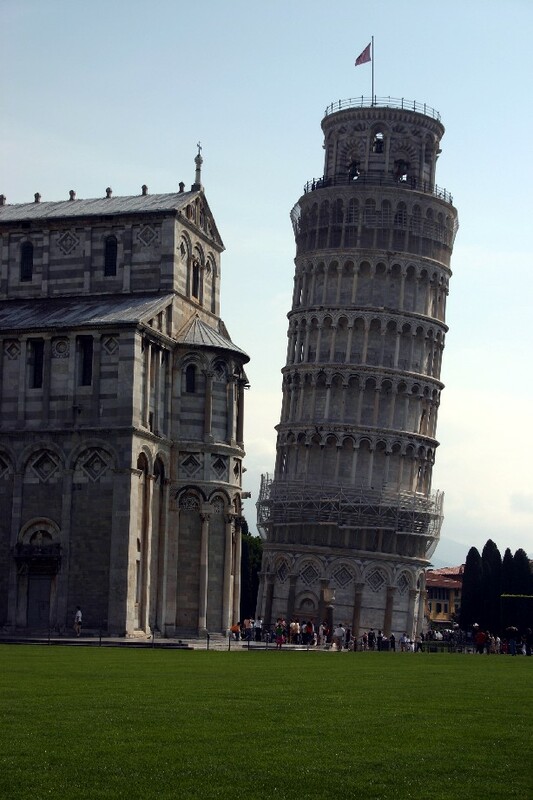 Once we got to the square, we were awed by the leaning tower. Went around the square, clicking pictures of the magnificent Duomo and the leaning tower. Spent about a couple of hours there and returned back to Florence after having our usual gelato in Pisa. On the way back to our hotel, picked up some sandwich. They were ok. Bland, husband was not kicked by it. Since we had the rest of the day with us, decided to head to see the famous David residing at Accademia museum. 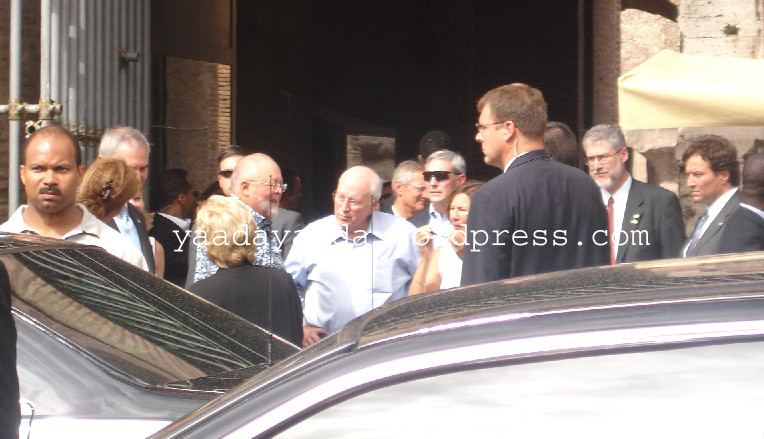 Everyone other than boo had warned us about the crowd and had asked to us make a reservation. We listened to boo and just walked in to the Accademia with no crowd. For some reason, all the museums had almost doubled their entrance ticket. It was 10Euro for Accademia. But let me tell you this, David was worth every cent. I am in love with David and Michael Angelo. It is sad that we couldn’t take a picture of him. Since this is getting a long post. Planning to split it. So watch out for Part 2. On Day 2, decided to explore the islands near Venice. Got up leisurely and had a wonderful breakfast in Hotel Bologna. Their breakfast buffet was quite impressive: Fruits, breads, Croissants, toasts, lot of pastries, juices, coffee, hot chocolate, eggs, meats, cheese. Stuffed ourselves and left for Venice S.M station. 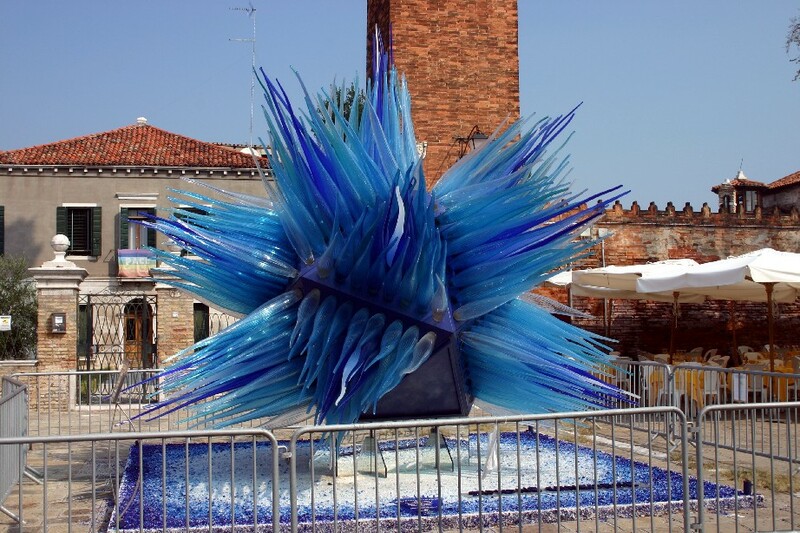 From there took the vaporetti to Murano, the island famous for its glasswares. It is about 30 minutes in the vaporetti from Venice. On Mondays most of their factories are closed. But we did see some glass making in one of the small shops. It was amazing to see how they manipulate a glass rod with the blow torch into a beautiful apple. Strolled around the island for an hour getting in and out of all the glass shops. The glasswares were so beautiful and expensive. Got some glass candies (That is all we could afford!) for myself and some murano glass ear rings for sisters in law. Went inside a small mall and had lunch. I had some sandwich and husband some pasta. It was ok. Then had gelato in a small shop. Awesome gelatos, Pista and tuttifruiti. The pista was natural with no essence.. Yummy!! Left Murano around noon for Burano, the lace island. 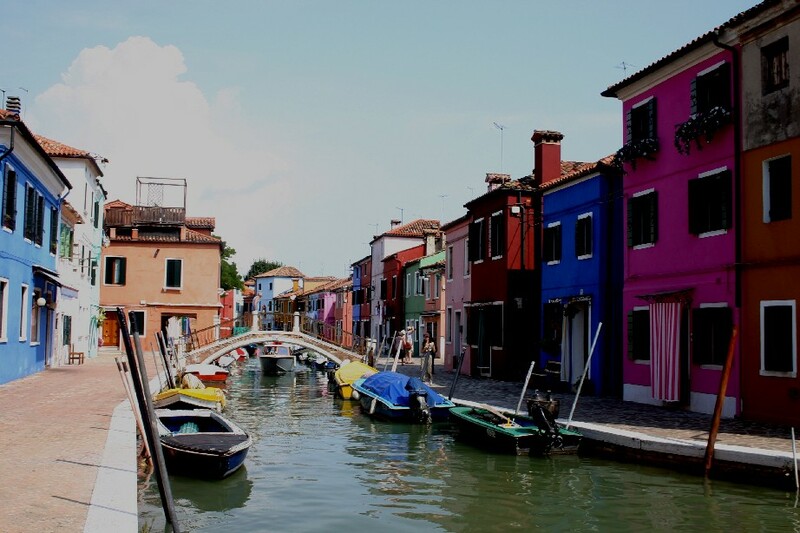 Burano was more impressive and colorful than Murano. We saw so many lace shops. The dresses in lace were so beautiful. I almost bought a blouse until i saw the price tag (250 Euro). We were so thrilled with the colorful houses that we clicked so many snaps. Here is a sample. After soaking in the beauty of Burano, got back to the Venice S.M station in the vaporetti. Tried to give our 3 day vaporetti pass to someone for free since it was valid for another 4-5 hours. After many reluctant people, a couple finally said took it and were so surprised that it was free. Then got back to the hotel in Venice Mestre. Freshened up, emailed and left for Florence in EuroStar train. Spent the 2 and half hours in reading books and playing cards. Watch out for the Florence, Pisa and Rome travelogue. We left for Venice in the Euro Night train from Zurich on Monday night. It was a 6 people coupe, 2 people didn’t turn up. So we were comfortable. It is very cramped in the upper berth even for a 5 foot medium built person like me. The 4 people coupe is very comfortable and it is worth spending the extra few dollars. Since we booked in the last minute 6 people is what we could get. They provided a decent breakfast in the train. 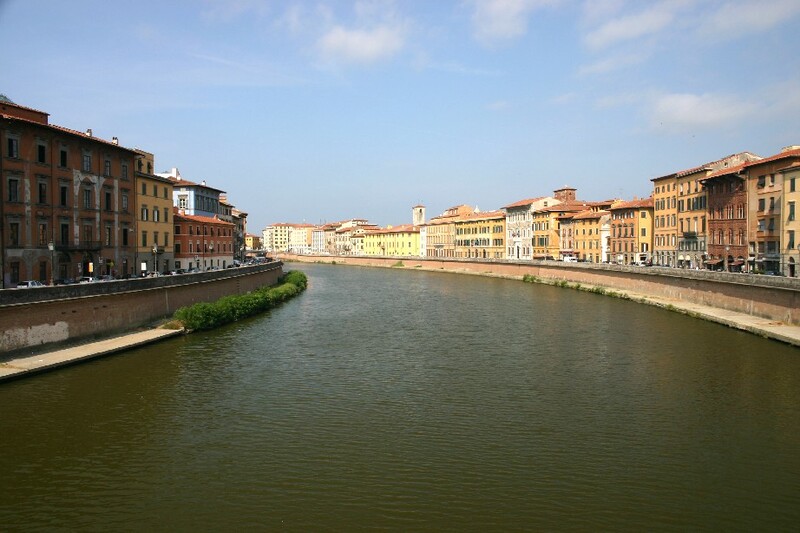 We reached Bologna at around 5 and took a regional train from there to Venice Mestre. Mestre is about a 15 mins trip in train from Venice Santa Maria station. The Hotel Bologna. was very nice. Very clean, spacious and just outside of the station. Awesome breakfast spread. The hotel let us check in early. So freshened up and left for Venice Santa Maria in the train. The information center was overly crowded so came out and bought the Vaporetti(the local waterbus) ticket. We bought the 36 hour ticket(21Euro per person). Well worth it. Took the Vaporetti to San Marco square. Venice is just magical. It is amazing to see this old beautiful city on water with its weathered down old buildings. We saw a huge line for San Marc’s Basilica so first went to Correr’s Museum and got the combo ticket(13Euro) for Doge’s palace and Correr Museum. Correr Museum was ok. Nothing spectacular. But it helped us to by-pass the line in Doge’s palace. Doge’s palace was nice. It was spooky seeing the prison and Bridge of sighs. Spent around an hour there. Then had the idly mom had packed in Doge’s palace. The line to San Marco’s Basilica was less by this time. So went to San Marco’s Basilica. The trick to avoid the line in San Marco’s Basilica is to have a bag to check in. If you check in the bag in the nearby bag check and bring the token, they let you in without standing in the line! 🙂 The Basilica was nice. There was a long line to climb the dome of the basilica so we chose to go up the San Marco’s Campenile. The elevator took us up. 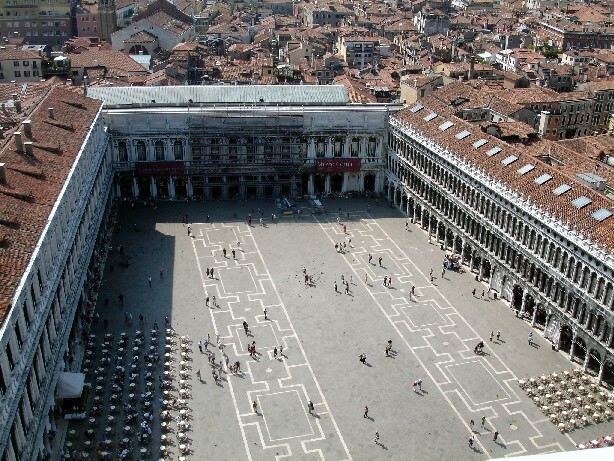 The view of the whole San Marco’s square and Venice was very nice from up there. Spent some time there, came down, took a walk in the narrow streets of Venice. The banks in Venice don’t exchange traveller’s check, so found a AMEX office and converted our money. To our shock, found that my passport in the secret waist belt got drenched and bent in all the sweat. Did some cosmetic cleanup to the passport and had awesome gelato to drown our sorrow. Then from there took another Vaporetti to Santa Maria Della Salute. The Dome is under construction, but the church was quiet and peaceful. Spent some time at the steps of the church polishing off the rest of the idlies. 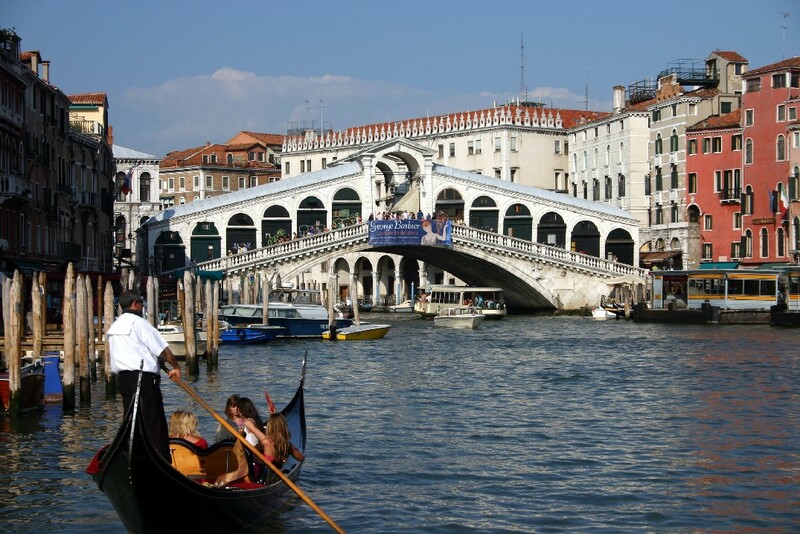 Then took another Varporetti to the famous Rialto bridge. The market around the bridge is very vibrant and colorful. 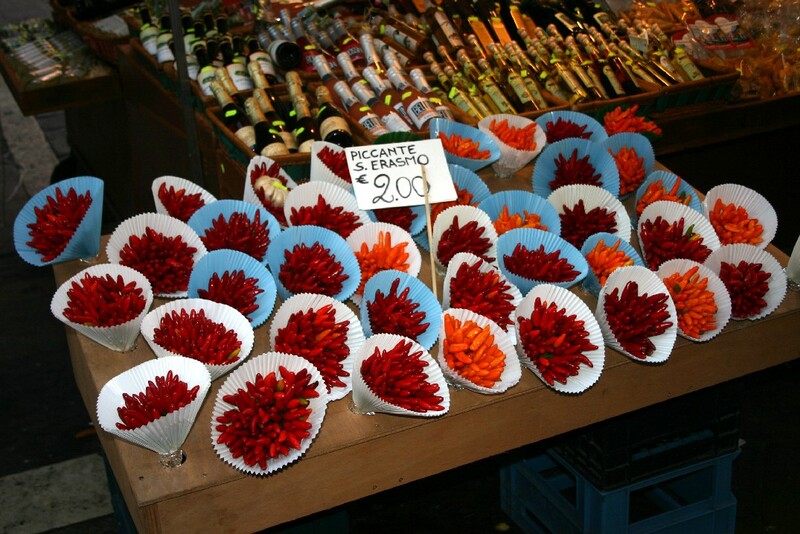 They sell all kinds of things from souveniers to handbags to belts to colorful chillies to fruits. Had some cut fruits, bought a mask and took another Vaporetti to San Marco square and relaxed a bit on the park there. From there walked back through the narrow roads to Rialto for dinner. Went to this quiet cafe(Rosticceria San Baratolomeo) recommended by husband’s cousin. Very tasty. 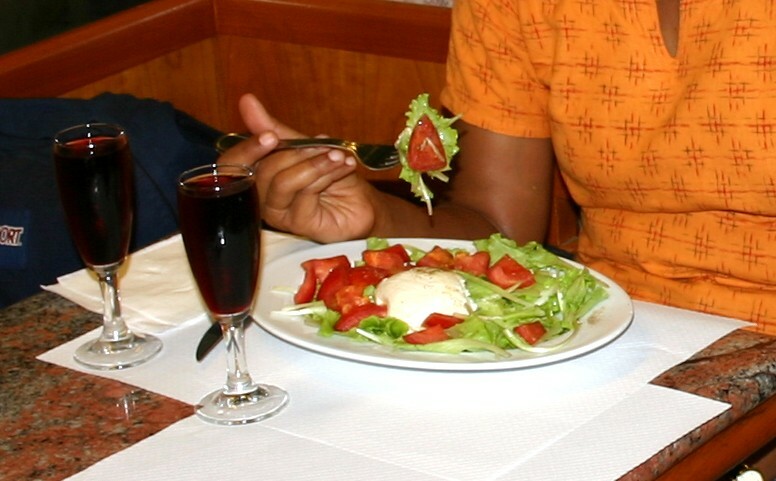 Ordered some wine, caprese and pizza. After a full stomach walked back to San Marco square to enjoy the night life there. The cafe’s in San Marco square have come alive with live band and lights. It was a festive atmosphere. Strolled around, enjoyed the music, and admired the couples dancing in the square without a care in the world. Took some night pictures and left for the station in the Vaporetti at around 9pm. There was around 20 mins wait for the vaporetti since lot of people were getting back and the frequency of vaporetti had reduced. Took the train to Mestre, sent mail to Boo and family from the lobby and retired for the day. Couldn’t believe we did so much in a day. Venice is like a dream now. We reached Booville on a Friday morning. Saw cutie pie Antu. She is just so adorable. You can just eat her. That sweet! She was all smiles seeing her periappa. Had a nice lunch thanks to mom and left with Boo to pick up Ashu. Ashu was surprised to see us. After a few minutes, got stuck to her periappa. From then on it was fun, fun, fun! Booville is in a beautiful location. Awesome views from her 10th floor balcony. Green hills, cows, foxes, horses, chickens, corn fields, apple trees, you name it. 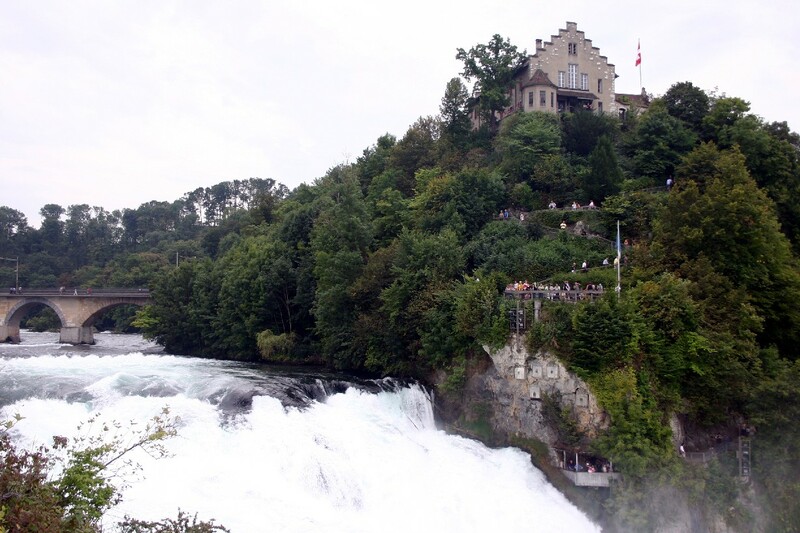 On Sunday, Boo’s hd rented a red van and took us all to Rhine Falls. It was just so beautiful. We had to hike down from a castle to the bottom of the river. 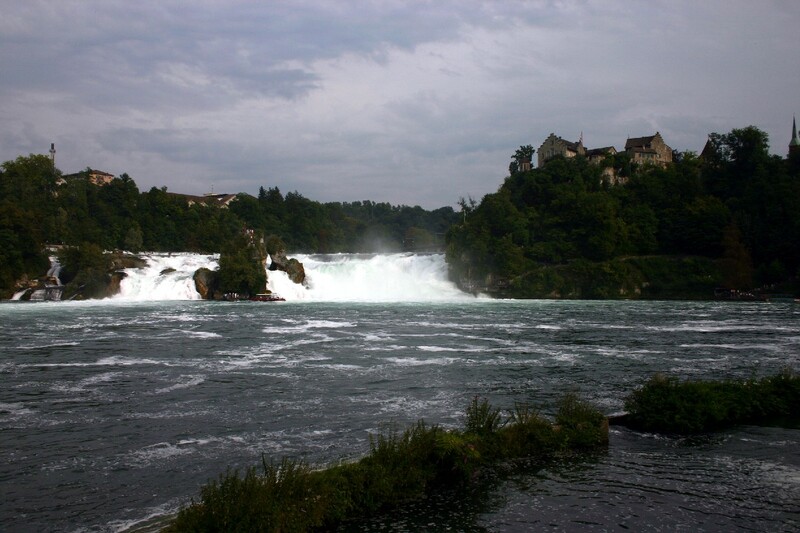 Then took a boat to the rock in the middle of the river to see the beautiful falls. Ashu was so co-operative and walked all the down by herself with her paatti. Antu was so quiet in her sling. The boat ride was beautiful. It was a thrilling experience climbing the rock in the middle of the river to soak in the view. Please note the boat and the rock in the next picture. Had a nice climb back to the castle and treated ourselves to some awesome cone ice cream. Ashu and Antu were such darlings through out this trip!! We can’t thank Boo and her hd enough for this wonderful trip!! Spent the next day walking up the hills near Boo’s house and drooling over the apples and walnuts on the trees. On Monday night left for Italy and came back the following Tuesday morning! Though we had great time in Italy, were missing Ashu and Antu terribly. Came back to Booville on Tuesday much to Ashu and our happiness. Had fun playing/singing/talking with Ashu and Antu. Our dad came on wednesday and Ashu switched all her loyalty to her thatha. We used that time wisely with Antu and playing Ticket to Ride Europe with everyone. My mom made thattai, vellaseedai, etc. Boo made her famous pizza and pineapple rasam. I made my famous Sabudhana upma(It wasn’t half as good as her pizza and rasam). Hd got us sprungli cookies, sweets, the awesome McDonalds Veggie burger. Why does Switzerland’s Mc Donalds have nice Veggie Burger, while the US McDonalds doesn’t even know whatz Veggie? Go Figure! Then after our two weeks vacation, with a very heavy heart said bye to Ashu and Antu and left for home. Should start planning for the next trip! Can’t get enough of Ashu and Antu! Guess he was trying to make the most of his last few months of his vice presidency. Post on fun at Boodam and Italy trip to follow soon! !